The production history of 26 Years (26년) is an incredible tale. Based on the popular web-comic by Kang Full (강풀), the film adaptation has languished in development for years as companies refused to finance the film due to the politically sensitive story – with some claiming the conservative government were the source of pressure. Frustrated, producer Choi Yong-bae went an alternative route to secure funding through crowd-sourcing, attracting donations from over 15,000 people which in turn garnered larger sums from celebrities such as musician Lee Seung-hwan and TV personality Kim Je-dong. As with the 2012’s other controversial film National Security (남영동 1985), 26 Years was timed to coincide with the presidential election and held particular relevance. The revenge story is based on the May 1980 Gwangju massacre, where Korean troops brutally suppressed the democratic protests killing up to 2000 people. The man responsible – dictator Chun Doo-hwan – was sentenced to death but later pardoned, currently living in seclusion at taxpayers expense. With prior dictator Park Chun-hee’s daughter, Park Geun-hye, running for the 2012 presidency, 26 Years was a not-so-subtle attempt at reminding the public of her legacy. The result is an incredibly exciting thriller with a poignant emotional core, one that occasionally requires leaps in disbelief and sometimes stumbles in generating tension, but a film that nonetheless serves as a potent reminder of the raw, unresolved wound that for many continues to be a source of pain within the nation. During the May 1980 Gwangju massacre, families were torn apart and forever scarred as loved ones were murdered before their eyes. 26 years later, the youths of the time have become adults and sought their way in life, yet the psychological scars that they carry from the time are still readily apparent. Kwak Jin-bae (Jin Goo (진구), who lost his father in the incident while his mother succumbed to psychological illness, has become a gangster at a nightclub. 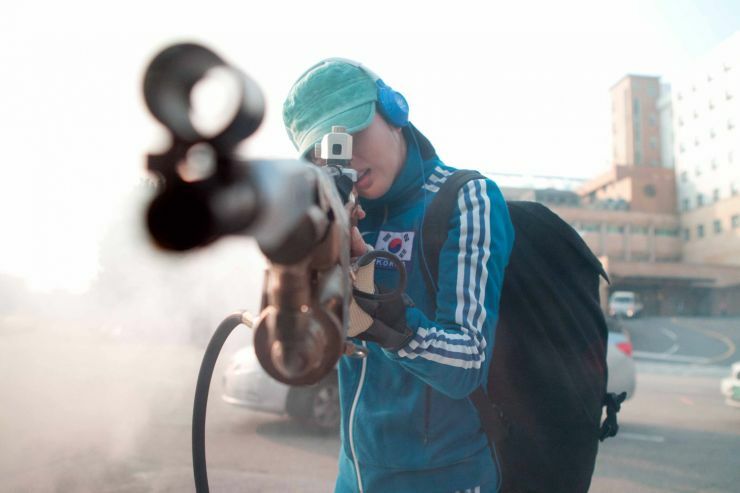 Sim Mi-jin (Han Hye-jin (한혜진) has become an Olympic marksman despite the death of her mother and father’s subsequent alcoholism. Police officer Kwon Jeong-hyeok (Seulong (임슬옹), whose sister was horrifically killed in front of him, is insulted further when tasked with helping the man responsible arrive home safely by changing traffic lights. When a former soldier who took part in the event called Kim Gap-se (Lee Kyeong-yeong (이경영) gathers the three together, they formulate a plan to finally kill ‘The Man’ (Jang Gwang, 장광) once and for all. Director Jo Geun-hyeon (조근현) does an incredible job of conveying the pain and suffering endured by the events of the Gwangju massacre. In a truly stunning animated sequence the history of the tragedy is presented, as well as the specific horrors that the individuals – who later form the revenge squad – experience. While such an approach could easily be melodramatic and even insulting to the victims of the conflict, director Jo deftly sidesteps such concerns by conveying the stark, unadulterated terror that was inflicted upon the people. Blood, psychological breakdowns, rotting corpses and disembowelment all feature in frightening detail, not only exploring the abject brutality of the atrocity but also providing powerful impetus for the those effected. The psychological scars brought about by the event are not ignored, and screenwriter Lee Hae-young deserves credit for their inclusion and elevating the narrative beyond a standard revenge thriller. Each protagonist has their own distinct neuroses, from Jin-bae’s outbursts of violence to Mi-jin’s cold and unemotional demeanor, and each serves a valuable purpose in the mission. Writer Lee also manages to include some wonderful moments, such as the oft-stated argument that dictator Chun was good for the country due to economic policies and the Olympic Games, a debate that is quietened simply through Jin-bae’s glare. In another, a police officer likens helping Chun arrive home safely to feeling ‘like being raped.’ These minor asides help to form a sense of Korean unity against corruption, and lend further legitimacy to the resentment against Chun and the assassination attempt. Chun, however, is never mentioned directly and is simply referred to as ‘The Man’ throughout the film, although it’s quite clear who is the villain. As the former dictator, actor Jang Gwang gives a highly effective performance conveying the stubborn, unremorseful antagonist with skill despite appearing in relatively few scenes. Jang seems to be adept in playing nefarious roles, as exhibited as a true-life child molester in Silenced (도가니), and his performance in 26 Years is certainly one of the highlights of his career to date. The rest of the cast also fare well, however due to the quite ambitious task of including so many individuals and narrative facets their character development, as well as that of their mission, is somewhat stunted. 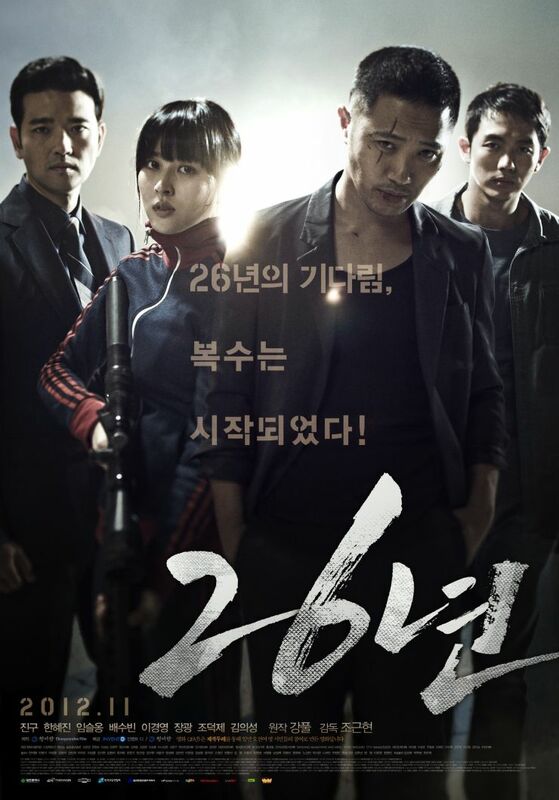 Of them all, Jin Goo as violent gangster Jin-bae receives the most amount of screen-time as he gradually changes from thug to team leader. Jin Goo brings an intensity to the role and conveys the required physicality well, quickly becoming the central hero of the film and his presence is always engaging and entertaining. His relationship with Olympic sharpshooter Mi-jin however is quite convoluted and unnecessary, particularly as there are precious few moments that explore the team dynamics or the relationships between each member prior to the forced romance. Han Hye-jin has stated that she wanted to role of Mi-jin as she wanted an acting role (rather than simply one for her appearance) although she never really attempts to go beyond cold stoicism. Police officer Jeong-hyeok, played by Seulong, suffers the most in terms of focus and is often a whiny irritation. This is a shame considering his backstory is one of the most poignant, yet his motivations are never really explored. Lee Kyeong-yeong, who also starred in the aforementioned National Security, provides a unique perspective as a soldier forced to take part in the Gwangju massacre and performs well with the material he is provided, but again the great many facets within the narrative don’t allow further room to explore his guilt. Despite the fairly brief character development once the team forms, their combined efforts during the assassination attempts are thrilling and adrenaline-inducing. Even though it is fictional, it is genuinely exciting, even cathartic, to see the man responsible for the Gwangju massacre in the crosshairs of a victim he created and as such brings a fresh perspective on the old debate between revenge and justice. The lines between ‘good’ and ‘bad’ are continually blurred as a result, with the police and security officers set up as opposition but are themselves conflicted by their roles. While the attempts to kill ‘The Man’ occasionally require the odd leap of disbelief and are overly long, the audience investment generated throughout makes the action and tension incredibly engaging. With an fraught production history finally culminating in crowd-sourcing, 26 Years is a great cinematic adaptation of Kang Full’s webcomic. With its politically sensitive story involving the 1980 Gwangju massacre and the subsequent pardoning of the dictator responsible, the film strikes an emotional chord despite the fictional revenge tale. 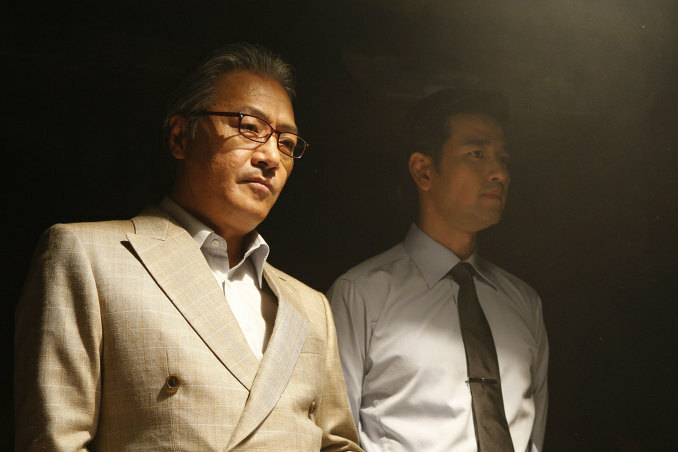 Director Jo Geun-hyeon and writer Lee Hae-young have produced a highly engaging thriller and is a poignant reminder of the legacy of Chun Doo-hwan’s regime.